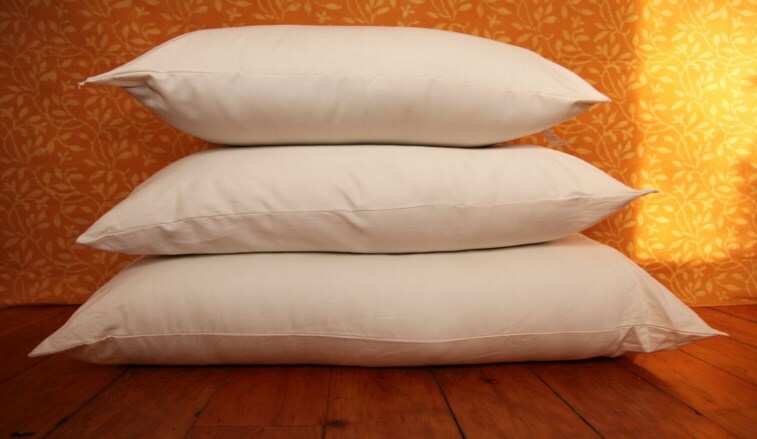 Sleep with comfort on these chemical free wool pillows. Each is covered with certified organic cotton sateen and is filled to capacity with soft, fluffy woolen batts to accommodate the natural 30% compression of the wool over time. The pillows are designed so each individual can adjust the thickness to their comfort level. To do this…Simply trim the serged/overlocked edge and remove the rolled batting . Unroll to the desired thickness and cut off the excess. Reinsert the rolled wool and seal the end of the casing by hand or machine. Keep the extra wool to add in as the pillow settles. This way the pillow will continue to be as perfect as you want. Everyone loves their “own” pillow. This allows you to have it tailor made for you!! !